I usually feed my children oatmeal and hot chocolate for breakfast, but on occasion, organic cold cereal is a quick solution on a rushed morning. We have tried Envirokidz organic cereal, and my favorite flavor is the gluten-free Gorilla Munch. 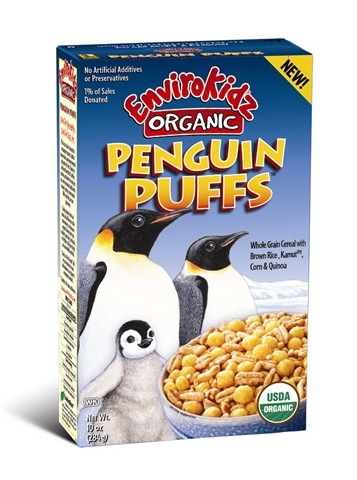 Nature’s Path has just introduced two new flavors of Envirokidz: Leapin’ Lemurs and Penguin Puffs. The story behind Nature’s Path is kind of interesting. In 1971, Arran Stephens and a business partner opened LifeStream, Canada’s first large organic supermarket. This store quickly expanded into a natural food line founded on the principle of “wholesome foods grown and processed in harmony with nature”. Ten years later, an awkward partnership led to the sale of the company to Kraft/Philip Morris. In 1985, Arran and his wife Ratana started Nature’s Path, which quickly grew to the point that they built the first third-party certified organic cereal plant in the world in BC. Arran and Ratana were even able to purchase Lifestream back from Kraft, something you don’t usually hear of happening when giant corporations buy out smaller health food companies. Leapin’ Lemurs is a peanut butter flavored cereal with chocolate balls, and I have to admit, I don’t think peanut butter and chocolate belong in cereal. My kids loved it and ate the box up quickly; their father thought it was too sweet. It is organic and gluten-free, as well as sweetened with organic evaporated cane sugar. I like Penguin Puffs. It reminds me of a cereal I ate as a child and is not too sweet. The puffed Kamut, quinoa, and corn are quite tasty. Not only does Enviorkidz use whole grains in their cereals, they donate one percent of sales to to the EnviroFund to help protect endangered species, habitat conservation, and environmental education for kids. My children love learning about the species featured in the products, and I feel good feeding them organic cereal. I also appreciate that many of their products are gluten-free. i grew up on unsugared cereals and really feel like peanut butter and chocolate don’t belong at breakfast but now as an adult i can appreciate them as a treat – barbara’s peanut butter puffins are a total weakness as a snack food. Sounds yummy. I always add some raw oatmeal to cereal to cut the sweetness. Happy Mother’s Day! I am so blessed to be a mother! Jennifer and Kristen Featured on the BBC's "World Have Your Say": Would You Stop Having Kids to Save the Environment? Organic Raw Berry Lemonade, Oh My!